In your dashboard, head to MemberPress -> Activate -> Addons. There you will find a link to install the Drip Addon. Head to MemberPress -> Options -> Marketing tab. You should now see Drip listed. You can find your API Token in your Drip Dashboard -> Settings -> My User Settings -> API Token. Copy that token, and paste it into MemberPress' Drip options. MemberPress will add these Tags to all new subscribers. However, these Tags will not be added if the member did not check your opt-in checkbox when signing up. If you'd like to set up special Tags for each Membership level (strongly recommended) then follow Step 5 below. The power of this integration comes from your ability to add specific Tags for each Membership level. MemberPress will automatically add the tags in your "Active Tags" field to the subscriber when they are active on the Membership. 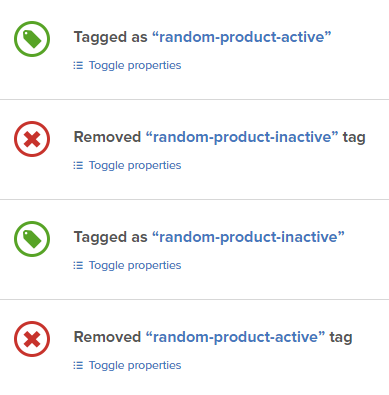 And conversely will automatically remove the "Active Tags" and then add the "Inactive Tags" when the member is inactive on the Membership. So in essence, these two Tags fields will toggle on the subscriber's account based on their membership status. This is a great way to begin to segment your subscribers in your Drip account and set up various automations based on these tags. So to recap, MemberPress will add the Global Tags to all subscribers unless they did not opt-in during signup. The Global Tags are never automatically changed once set. MemberPress will, however, automatically add/remove Membership-specific Tags based on the member's current subscription status on that Membership. You can then utilize this automatic tagging behavior to create automations in your Drip account for your subscribers.